To cite this article: Castillo, Roberto (2014). Feeling at home in the “Chocolate City”: an exploration of placemaking practices and structures of belonging amongst Africans in Guangzhou, Inter-Asia Cultural Studies, 15:2, 235-257. “China is the new land of opportunities,” I am told by Chuck, a 33-year-old Igbo from Imo in Nigeria. After attending a Sunday evening Christian Pentecostal congregation, Chuck picks me up to go to the restaurant he owns in the vast Guangda Clothing Wholesale Market in the north of Guangzhou. Lost inside this massive compound of warehouses and stores is the newly opened Guangda African Market—a commercial space allocated by the city’s authorities to leaders and representatives of the various African communities. Chuck first came to China, without any contacts, in 2006; then, after moving back and forth for two years, made Guangzhou his operating base in 2008. He recalls that, in the beginning, it was not easy. “The thing is that there is no real employment in China, here you have to employ yourself, be creative.” After almost five years in the country, Chuck has managed to become a restaurant owner (Guangda African Restaurant), a trade representative (mediating business deals between Chinese and Africans), and a fashion designer (designing and manufacturing clothes that he sells in his shops in China and Nigeria), along with actively participating in the Nigerian community office’s activities. Whilst drinking a beer in his restaurant—a richly decorated space that juxtaposes modern design with two gargantuan posters of fauna from the African savannah—I muse that Chuck and I may belong to the same generation of young people from “developing” countries that grew up in a world where the possibilities for migration were relatively rigid. If you needed (or wanted) to go abroad, the “North” was, almost inevitably, your only choice. As a middle-class Mexican, I could have journeyed north to seek employment in the United States or Canada, or perhaps, with the luck I have had in Asia, been “educated” in a university somewhere on the American East Coast. Chuck, on the other hand, could have gone to Europe, South Africa or, perhaps, the Middle East. Times have changed, however. Both of us arrived to China in 2006 (without previous knowledge of or connections to the region) and began juggling a plethora of different visas to manage the then highly erratic Chinese visa system, whilst trying to generate a measure of stability along with work/business opportunities. From all appearances, Chuck’s entrepreneurial prowess (with his restaurant, representation office, fashion shop, and import-export business), clearly exceeds mine—at 33, I am wading through a PhD and living on a scholarship. China, or more specifically what we both knew from international media about China’s growth/rise, represented a refreshing (albeit challenging, risky and unstable) opportunity to build our lives in less established/traditional, yet more transnational, ways. Over the last 15 years, the relative relaxation of foreign entry and settlement in China and the increased accessibility and affordability of international air travel, have led to waves of foreigners (like Chuck and I) arriving in search of material and immaterial wellbeing. Located within the context of the impact of diasporic cultural globalisation in twenty-first century Asia, this article is an exploration of certain elements that structure the contemporary presence of Africans in China. Drawing on preliminary findings in my fieldwork, I place particular emphasis on three issues crucial to sense-making in the city: place-making processes (some of the ways in which Africans intersect with Chinese on a spatial level); structures of belonging (built through organisations and communities); and strategies for settlement and mobility (developed to counteract what is perceived as institutional barriers to their presence in China). In the following pages, I argue that the continued and recurrent presence of Africans in Guangzhou, and their connections with other Africans and Chinese of diverse ethnicities, have resulted in the unintended emergence of multiethnic “catering networks” that generate the necessary spaces for African communities and organisations (“networks of support”) to materialise. These networks of support, in turn, facilitate place-making processes and enhance the development of structures of belonging, which are central to the production of identities and the articulation of (sometimes transient) feelings of “at-homeness,” amongst Africans in the city. I contend that this dialectical process is central to the reproducibility of the Sino-African ensemble in Guangzhou. Moreover, I claim that a better understanding of the complex transnational and translocal dynamics enmeshed in this case study is crucial to make sense of the implications that the “rise of Asia” has had, and will have, in Asia, Africa and the world. The article is structured as follows: in the next section, I locate this case study within the macro-narrative of the contemporary rapprochement between Africa and China, before tracing the histories and types of journeys that have brought individuals from all over Sub-Saharan Africa to Guangzhou. In the second section, I discuss issues related to the labelling of Africans in Guangzhou as migrants/immigrants, and then outline some of the patterns and behaviours displayed by Africans in transnational settings. Finally, I examine how place-making processes are undertaken at the individual and spatial levels and how this place-making structures senses of belonging. Throughout all these sections, I illustrate how the aforementioned networks are crucial devices in the reproduction of the African presence in Guangzhou. A cautionary note on terminology is in order here. While I have elsewhere criticised the use of categories such as “African” and “Chinese,” as they tend to flatten out diversity and complexity, I still use these categories in some situations, as they are efficient discursive tools for explaining things. When needed, however, I unpack both categories and refer specifically to the various ethnicities and nationalities subsumed into them. Before proceeding, I must state that while I have started by comparing Chuck’s journey to China with mine, this article will not be a comparison of our experiences in this country. It is not news that Chinese investments and commercial migration to Africa have had a profound impact on the continent’s economies and on the livelihoods of its people (see Alden 2007; Brautigam 2011). Take for instance commercial exchanges. China–Africa trade volume has had more than a twentyfold increase over the last decade—reaching US$200 billion in 2012 from US$10 billion in 2002 (Africa.news.cn 2013). Over a slightly longer period, direct exports from Guangzhou to African countries (mainly manufactured products)1 have increased more than tenfold—up from around US$165 million in 1996 to US$2.1 billion in 2010 (Li, Lyons, and Brown 2012, 57). As a consequence of these structural macroeconomic pushes, and of individual microeconomic efforts, only a decade after the intensification of Africa–China economic relations, China is now Africa’s largest trading partner, having surpassed the United States in 2011 (Wonacott 2011). Over this period, Chinese migration to several African destinations has had an unparalleled increase—there are now an estimated one million Chinese on the continent, up from less than 40,000 in the early 2000s (Brautigam 2011; Michel and Beuret 2009). Commercial activities related to this massive flow of people into Africa have resulted in what has been described as a “tsunami” of Chinese goods—“made in China” products are now ubiquitous in the markets of almost every big African city (Zhang 2008, 388). This “tsunami” has spurred scores of traders to develop their own transnational trading strategies in an attempt to outdo their Chinese competitors, and a first step in these strategies is often journeying to Guangzhou (Bertoncelo and Bredeloup 2007). Although Chuck does not view his presence in Asia as a direct counteraction to the wave of Chinese migrants and goods in Africa, he (along with almost every other African I have met) considers himself to have the “right to be in China.” Again and again, during my fieldwork, I have been told that “if Chinese are there [in Africa], we should be able to do business here.” A great number of those that set out to do business in China are informed and bolstered by this rationale. Moreover, during the last decade, the omnipresent global media narrative about the “rise of China,” along with word-of-mouth about “green pastures” and “new lands of opportunities” has lured thousands of Africans (and many others) to journey to the heart of Guangdong province. These new ways of talking about (or imagining) China are also increasingly influenced by the growing “soft power” that the People’s Republic has been disseminating across the continent. The emergence of Sino-African media outlets such as Xinhua’s South African Newspaper “Africa Times” or CCTV Africa (based in Nairobi, Kenya), and projects such as “Xinhua Gallery,” a 2011 photographic exhibition depicting the lives and works of “Africans in China” (which kicked off simultaneously in 18 African countries), are good examples of this. However, the contemporary presence of Africans in Guangzhou can only be partially explained by these wider narratives of recent economic and political rapprochement. Africans are, in fact, not entirely new players in China’s (or Asia’s) “ethnoscapes” (Appadurai  2003), and their presence in the region, as suggested by Bertoncelo and Bredeloup (2007), predates the recent intensification of state-level economic relations. Long-term transnational traders, with trading networks extending from Africa and the Middle East to Southeast Asia, arrived in China right after the collapse of the “Asian Tigers” in 1997. Malians involved in mineral trade since the early 1980s, for instance, left their positions in Bangkok, Jakarta and Hong Kong after the crisis to establish pioneering outposts in Guangzhou (Bertoncello and Bredeloup 2009; Zhang 2008). Around the same time, Nigerians that had cut out Middle Eastern intermediaries began opening their own export offices in the Special Economic Zone of Shenzhen (Bertoncello and Bredeloup 2009), before later moving to Guangzhou. These early pioneers carried out the collective, but perhaps unintended, task of opening trading routes, opportunities, and imaginations for the next generation of African entrepreneurs. “No one really knows how many Africans are there in Guangzhou,” Chuck tells me. “We are trying to organize a registration procedure, but it has not been easy.” Data from the last national census—the first ever accounting for foreigners—indicate that there are currently some 600,000 registered foreigners living in the country—along with some 400,000 residents from Hong Kong, Macau and Taiwan (NBSC 2011). Citizens from countries such as Korea, the United States, Japan, Myanmar, Vietnam, Canada, France, India, Germany and Australia account for some 70% of foreign residents (some 420,000). Guangdong province is reported as hosting the majority of this combined population (Hong Kong, Macao, Taiwan, and foreigners) with some 300,000 individuals. At this point, it is important to note that the category of “foreign residents” used in this statistical measurement does not account for the number of “unregistered” foreigners (those “living” in the country by extending or renewing tourist, business or student visas, and those who overstay their permits). Nonetheless, it comes as no surprise that the census points to Guangzhou as hosting the greatest number of foreigners. Over the last decade, Africans have been the most salient group of foreign residents and transient populations in the city. 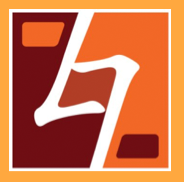 Interestingly, despite a lack of reliable data on the numbers, nationalities, and activities of these subjects, the hype about “Africans in Guangzhou” has led several researchers to either lay claim to non-rigorous calculations or accidentally reify rumours resulting in figures ranging from 1500 to 20,000 to over 100,000 (see Bodomo2010; Li, Ma, and Xue 2009; Zhang 2008). Unfortunately, these widely quoted figures are nothing more than speculation bolstered by media claims (ubiquitously reproduced) of an African population growing at a rate of 30 to 40% annually since 2003 (see Branigan 2010; Osnos 2009, amongst countless others). Over the last five years, scholarship has attempted not only to determine numbers but also the nationalities of Africans assembling in Guangzhou. The latter has also proven difficult; the ease of obtaining Chinese entry visas is highly erratic and seemingly dependent on the particular relationship China is having with each African state at that time. Back in 2008–2009, Adams Bodomo (2010) reported that the majority of people, in what he calls “the African community” of Guangzhou, were coming from Nigeria and Ghana and, to a lesser extent, from Mali and Guinea. Around the same time, Zhang (2008) and Li et al. (2008) wrote that the Africans in the “ethnic enclave” they were surveying were mainly Francophone from West Africa (presumably, Mali, Senegal and Guinea). Besides these authors, there have been no further attempts to establish the origins of Africans in the city. “Africans in Guangzhou” is an umbrella term that encapsulates a wide variety of origins and trajectories. From economic crises to international relations, from individual drives to itinerant trading traditions, there is a plethora of factors involved in determining who is moving between Africa and China, and how and when they are moving. Most Africans I have met in Guangzhou move back and forth often. Some people travel once a month, others once a year. There are, of course, those who come once, have long sojourns (sometimes overstaying their visas), and then never come back. There are countless individual stories; however, I claim that a great deal of those discursively identified as “Africans in Guangzhou” share one important feature: transiency. This transiency (bolstered by an increased “transnational mobility”) renders the task of pinning down national origins (or population figures) almost an impossible one. Furthermore, I argue that if a focus is put on transiency, the debate about nationalities and numbers loses currency. Focusing on transiency does not necessarily mean that I contend that Africans have not established roots in the city—people on the move “may develop a sense of ‘being at home’ in the world despite relatively transient connections to particular places” (Conradson and Latham 2005, 288). Instead, this focus helps me to better understand the ways in which many of them have developed this sense, while simultaneously maintaining relations in several locations. Indeed, I maintain that the African population in Guangzhou is a transient and “recurring” one. In order to follow this argument and clarify notions of transiency and recurrence, it is useful to focus on trajectories. The “more established” individuals are usually older traders (mainly middle-aged males—with a few exceptions) who have been doing business in Guangzhou for more than a decade. They usually have considerable investments in the city, and are very well connected with local producers, as well as with authorities and other foreigners. Many of these individuals have managed to open offices (where they usually act as middlemen between Chinese and Africans) and shops in local clothing and electronics markets. Some of these individuals have established trading organisations that, in some cases, have become national representations offices. While most of the individuals in this category have long been participating in the transnational trading networks mentioned earlier, a significant proportion came to China in the early 2000s directly from their countries (mainly Mali, Ghana, and Nigeria) without much previous trading experience. Back then, some of them found themselves almost accidentally involved in the then flourishing garment trade and from there they learnt how to shift into other trading activities in China. Due to their capacity to adapt, many of these individuals succeeded in becoming businessmen—a fact that to some extent has facilitated their continued presence in the country. A minority of those in this broad category (but still a considerable number) have managed to establish families—either by marrying Chinese women, or by bringing their families from their countries. In a way, as their understandings of Chinese cultures are decidedly more extensive, these “more established” individuals function as “mediators” and “facilitators” influencing and negotiating the movement and temporary settlement of their fellow co-nationals, thus benefiting from their ability to be located in China (Bredeloup 2012, 32). It is important to note, however, that while their stay in the country is in most cases legal (they are more prone to hold longer-term stay permits), there are no working “immigration” frameworks that would ensure their permanent stay or citizenship in the country—the fact of being married to a Chinese or having a business in China does not guarantee a right of abode. Most individuals in this category have relative proficiency in a Chinese language (usually Mandarin, but sometimes in Cantonese or another dialect). The second broad type of trajectory (“itinerants and semi-settled”) comprises all those who frequently move back and forth between (and across) the two regions. Most of these subjects have their own rhythms and move at significantly distinct paces. Take for instance some of the “itinerant” Angolan women that lodge in the hotel where I usually stay. The most active amongst them travel back to their country every 4 to 6 weeks. They usually travel alone (sometimes in pairs) and, once in Guangzhou, rely on other female traders for lodging and business contacts. As Angola and China have strengthened their economic links, it is relatively easier for Angolans to obtain entry visas to China than it is for say Nigerians. Michel, a “semi-settled” Angolan trader I met during one of my fieldtrips, for example, has been in China for three years now—needing to exit the country only once every year. The possibilities and mobility he gets from his visa arrangement stand in stark contrast to those of Nigerians, who usually only get 30 days non-extendable visas. I contend that individuals in this category are the bulk of what has been construed as “the African population” in the city. Guangzhou’s Africans are people on the move—transients. In their incessant transnational and translocal commutes, these individuals “circulate” between different trading posts, sometimes relying on the dealings and infrastructures set up by “more established” individuals, in the search for comparative advantages, as Bertoncelo and Bredeloup (2007) have put forward. Semi-settled individuals (like Michel) are more like economic explorers seeking opportunities, anticipating trends, mediating deals, and sometimes buying directly from the Chinese to resell to other Africans (Bertoncello and Bredeloup 2009). This category comprises many of those who, moving back and forth between Guangzhou and places such as Abuja, Nairobi, or Dar-Es-Salaam, have reacted with transnational individual entrepreneurial efforts (import-export strategies) in an attempt to counter Chinese presence in African markets (as discussed earlier); and also more experienced translocal/transnational itinerant traders (i.e. Angolan women and Igbo Nigerian men). The presence of these Angolans and Nigerians in Guangzhou could also be seen as a contemporary (re)articulation (relocation) of longstanding traditions of movement and trade—evidence of how certain African trading cultures of circulation, in their transnational mode, have finally reached China. Alongside these “more established,” and “itinerants and semi-settled,” almost anyone with some economic means, basic trading skills, and with the drive for adventure can start moving back and forth between the two regions. Indeed, many newcomers do so without relying on the structures laid down by more established individuals. The third broad type of trajectory, thus, encapsulates multiple stories of fortune seeking, success, failure, and becoming. These “newly-arrived” are usually younger individuals that have been propelled toward China in multifarious ways. Many of them, lured by the “new land of opportunities” discourse, collect funds amongst relatives and friends and set out on a “once-in-a-lifetime” (or “suicidal” as Chuck claims) mission to seek their fortunes in China—some manage to obtain business visas and are relatively successful; others, however, are less fortunate. Many individuals in this category lack trading experience, have a shortage of capital and a limited understanding of how things work in China, and are abroad for the first time. A high number end up stranded or “immobile,” (as reported by Haugen 2012) with difficult migratory statuses and a reliance on community networks to survive. Although the typology laid out above is useful to describe the different types of affiliations and commitments of the individuals in this case study, the very mobilities and fluidities they display (or could attain) renders it rather difficult to fix them in specific types along the settled/itinerant continuum. While, for instance, there seems to be a constant/recurrent presence of say, semi-settled people, these individuals can at any given moment, depending on individual strategies and circumstances (and/or macro-political conjunctures), attempt to become more settled (i.e. Chuck’s move from some sort of itinerant back and forth movement to a more settled position with his multiple businesses in Guangzhou). As Bertoncello and Bredeloup (2009) have argued, most African transnational traders go through unpatterned cycles of rest and movement (never settling, always departing, or vice versa, if you want) throughout their journeys. Seasoned and “settled” businessmen may relaunch into risky itinerant trade, while a newer itinerant trader might settle down for a couple of years only to reconvert a few years later (2009, 58). In other words, journeying through the transnational trading networks that connect localities in China and Africa, an individual may shift from being a football player looking for a try-out in the Chinese soccer league to a semi-settled trader roaming around factories in Southern China in the search for comparative advantages; or, from a Pentecostal clerk attempting to evangelise Chinese, to an English kindergarten teacher; or from an itinerant trader to a “settled” family man owning a restaurant and a cargo office. When we pay attention to individual stories, decisions, aspirations, trajectories, and mobilities (this is, to the individual ability to shiftas a strategy for self-realisation and/or survival), and to the instability of the context, it becomes rather clear how difficult it is to maintain a fixed distinction between settled, semi-settled, or itinerant. In short, I claim that in the case of Africans in Guangzhou (as seems to be common to several other African diasporas) the trajectories, paces, and paths these individuals undertake subvert, confuse, and blur the notions of movement and settlement that are pervasive in traditional/structural/economistic approaches to migration. Finally, I contend that this “ability to shift” while on the transnational move functions as something similar to a Foucaultian “technology of the self” (Foucault 1988). From Driscoll (2010, 184), I understand “technology” as “a set of tools, skills and literacies that intersect with systems of power” to subvert or reinforce certain orders. Some transnational movers, while looking for material and immaterial wellbeing (i.e. self-realisation), use this shifting ability as a strategic tool to break away with (or resist) social, local and national “class-like” constraints. Moreover, for many of these individuals, the ability to shift “transnationally”—both in the physical/cartographical sense theorised by Glick Schiller (Basch, Schiller, and Blanc 1994) and also in the transgressive, imaginative, and translational senses suggested by Ong (1999) and Appadurai (1996)—works, I claim, as a kind of techno-cultural device (or strategy) when searching for mobility and wellbeing in transnational settings. Finally, these abilities to move back and forth, to “settle” for a while only to relaunch later, to shift roles and identities, evince how complex and “unstable” transnational African journeys can be. Likewise, they also represent a great challenge to anyone attempting to depict Africans as “immigrants” in the process of assimilation in China, especially in a Chinese context, where the long-term “settlement” of foreigners (don’t even discuss assimilation or citizenship rights) is customarily hindered. Migrants, transmigrants, itinerants, nomads, global citizens? As I have been trying to show, the conditions for movement from Africa to China are multifarious. I contend that there is no single metanarrative that provides a comprehensive explanation. Take for instance Chuck’s story. He was not forced by a push-and-pull effect to migrate to China, nor was he the victim of an obscure, transnational, migration-brokering cartel; he came to the country of his own “free will” to “explore his potentials” (self-realisation). After travelling back and forth from 2006 to 2008 and surveying a number of Chinese cities, he chose Guangzhou as his operating base. “Here, unlike in Nigeria where the manufacturing and producing infrastructure is not so vast, you can do things. You bring your ideas and they can become real; you can produce everything you want,” he says. He is not the only one that thinks this way. Several Africans I spoke to (who also claim to have come to China “on their own”) see the country as an opportunity to work independently and build themselves a name, a brand, and a future. Chuck contends, along with many others, that he is an entrepreneur doing business in China. He has also told me that he resents representations of Africans in China as immigrants. “We are not immigrants here. You can’t be that here. China is not a country for migration—they need no migrants,” he explains. Chuck considers himself a “citizen of the world” that has strategically decided to go to China. “You need to go where you can fulfil your potential. Now is China. It could have been anywhere else,” he comments. Interestingly, the labels of “migrant” and “immigrant” were rejected by most of my interviewees as they associate such labels with refugees and people living through hardship. Most people I spoke to have plans to leave China in the future—most intend to go back to their countries, some hope to save enough money to move to Europe or North America. However, in an attempt to make sense of the flow of people from Africa towards China, numerous reports have construed these subjects as a wave of immigrants (often represented as sojourning illegally in China), and struggling to survive whilst evading police persecution on a daily basis (see for instance, Haugen 2012; Li, Lyons, and Brown 2012). While that could be the case for some individuals (and it undoubtedly is), it is certainly not the case for the majority. Not only do many Africans in Guangzhou not see themselves as “migrants,” it is impossible to “immigrate” to China in the way immigration is usually discussed in Western contexts. As pointed out earlier, China lacks a stable institutional legal framework for migration. So, holding a “permanent resident” permit is the closest one can get to becoming an “immigrant.” Over the last three decades, the Chinese government has granted fewer than 4000 of these permits (This is Beijing! 2012)—in a country of 1.3 billion with a foreign population of 600,000, such a tiny figure might indicate that an immigration framework is not a central interest. Before proceeding, I want to make it clear that I am not trying to make a case against the notion of the “migrant”—or against decades of tradition in Migration Studies. I do not intend to claim that due to the simultaneous and multiple transnational/translocal attachments and commitments generated by the intensification of interactions in contemporary global human movement, we now live in a “post-migration world.” However, I do endeavour to highlight the need to problematise mainstream assumptions that are prone to locate all those (predominantly non-”Western” subjects) whose life journeys have taken them to move between foreign and familiar lands within the boxes of migration, assimilation, and settlement—a practice rife in traditional streams of Migration Studies. To assume that most Africans in Guangzhou (or China) are (or desire to become) “immigrants” is not only a point of resentment amongst those Africans living in Guangzhou—as suggested above—but more importantly a legacy of sedentaristic methodological approaches that assume that settlement is normal, and treat distance, change, instability, and placelessness as abnormal. These approaches tend to correlate concepts such as migration, home and origin with those of immigration, host and arrival. Although they are good for sociological explanations, these binary structures simplify human flow and tend to disregard the multiplicity of trajectories, mobilities, classes, genders, traditions and personal desires and stories driving (in conjunction, of course, with more structural imperatives) the transnational movement of the individuals in this case study. In problematising the concept of “migration,” I suggest that the notion of “transnational mobility” be adopted as it better accommodates human (and non-human) movements beyond the limited definition of migration—understood as residing and settling in another country for a long period of time—and away from the home-host, departure-destination, origin-settlement, and assimilation-acculturation binaries and tropes. Mobility is a more dynamic term that emphasises the fluidity, itinerancy, transience and changeability of the subjects in this case study. By thinking of “transnational mobility” instead of “migration,” not only the regularities but also the irregularities of human transnational movement are incorporated. Additionally, a space is opened to look at those dwelling on the move (transnational mobiles/nomads?) and to better understand how transnational and diasporic networks are mobilised. Moreover, by challenging the telos of inquiry and methodological research in structural studies of migration, the notion of “transnational mobility” resonates with the trenchant critiques of the bounded and static categories of nation (methodological nationalism), community, place and state offered by theorists such as Appadurai (1996), Glick Schiller (Basch, Schiller, and Blanc 1994), and by those theorising the formation of translocal identities (i.e. Mandaville 1999). A transnational mobilities perspective could also be a point of convergence of previous theorisations on transnationalism, translocality, mobility, networks and assemblages. As is evident in Chuck’s claim to “global citizenship,” a sense of “transnational mobility” challenges geographically bounded notions of “at homeness.” Sometimes “home” becomes embodied—a project that is carried and reproduced on the move: under conditions of transnationality home is where you make it, where you are. So far, I have located this case study within the macro-narrative of the contemporary rapprochement between Africa and China: I have traced the broad trajectories, types and histories of some Africans in Guangzhou; and I have discussed certain aspects conditioning their transnational movement and/or “migration.” In the following section, I focus on place-making practices and structures of belonging as strategies used by individuals to stabilise and extend their livelihoods and presence in China. “Place-making” usually starts with the appropriation (individual or collective) of a particular area (space) of a city by those who are perceived as “outsiders” by earlier settlers. In most of the literature on place-making, the notion refers to the ways in which migrants forge collective identities when facing discrimination or poverty in a host society. In this way, the concept is often understood as a strategy for settlement that allows migrants to develop “common identities and means of mobilising collectively” (Gill 2010, 1157). The experiences of African transnational movers in Guangzhou show that while place-making is, indeed, a generator of “common identities” and “opportunities for collective mobilisation,” it is also an unstable process that does not necessarily lead to the perpetuation of individuals or collectives in the host country. Moreover, place-making is not always linked to poverty, discrimination or the intention of settling down. Although this practice can be analysed on several levels, this article focuses on the micro level of the individual and the mezzo level of communities and organisations. This is, how individuals “make place” by first congregating in a neighbourhood (where forms and meanings associated with imaginings of “home” and “community” start to be reproduced), and then participating in (or developing) organisations that facilitate the reproducibility of their presence. By sketching out how individual and collective place-making processes structure the experiences of Africans in Guangzhou, I locate the spaces where senses of belonging and affective attachments are being produced. For individuals in Guangzhou, place-making as a process transforms space into familiar places and generates personal attachments and commitments—it is often used as a survival strategy and as a tool to unveil opportunities in a new place. In short, I argue that it is a process that entails a dialectical unfolding of affective correlations between self and place that help individuals to make sense of an unfamiliar environment. At a collective level, on the other hand, place-making is usually linked to sets of strategies that communities and organisations employ to assert a collective identity among host populations (Gill 2010, 1157). In the case of Guangzhou, the attempt by the Nigerian community office to promote a positive African image (an attempt that I will discuss later in this article) could be seen as an example of collective place-making. If there is a crucial locale in the processes of place making for Africans in Guangzhou it is Dengfeng (dengfengcun)—an “urban village” (chengzhongcun) that looks more like a rundown neighbourhood than a village, and that forms an ensemble with the more modern and contiguous neighbourhood of Xiaobei (xiaobeilu). Dengfeng is one of the hundreds of villages that in the last few decades have been engulfed by Guangzhou’s booming urban expansion/development. Historically, internal migrants have tended to congregate in the relatively marginal settings of Guangzhou’s urban villages, where the costs of living are lower (Zhou and Cai 2008). 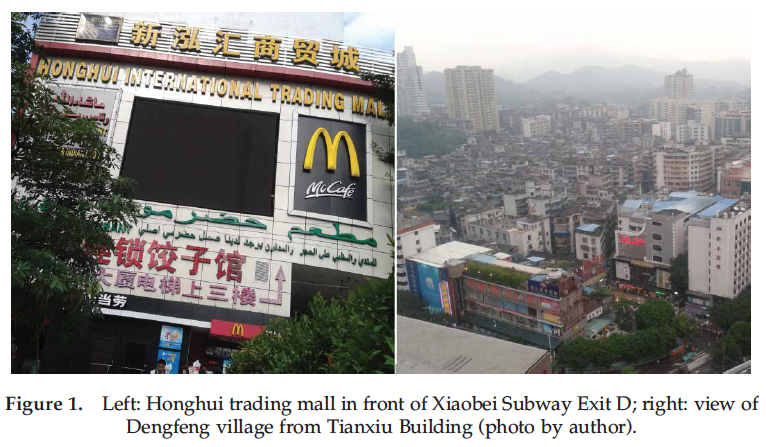 As Guangzhou’s re-articulation into the global economy took hold, Dengfeng’s strategic geographical location (a short walk from Guangzhou Railway Station and across from Tianxiu Building (tianxiudasha)—a centre for Chinese, Middle Eastern and African import-export activities), made it a centre not only for translocal but also for transnational exchanges. Over the last 15 years, the whole area has been radically transformed as a consequence of the constant presence and recurrence of transnational traders from the Middle East, South Asia and Africa, and by their interactions with the continuous transprovincial flow of internal migrants from the Chinese hinterland. Owing to the high visibility of Africans and other foreign groups, the media and some scholarship have coined this area as the “Chocolate City,” the “Little Muslim United Nations,” and, more recently, “China’s Little Africa” (Gillet 2013; Li, Lyons, and Brown 2012; Osnos 2009; Zhang 2008). However, these conceptualisations fail to grasp the complexity found on the ground. They tend to blur the importance of the activities carried out by diverse ensembles of Chinese ethnic minorities that also converge on the area. Dengfeng’s main entrance, flanked by a Public Security Bureau Office (police station), is a dimly lit tunnel usually bustling with pedestrians. Most other entries to this urban village are partially gated. Roaming through the cramped alleys of the village, one can witness first-hand the thriving interactions between several Chinese and African cultures and economies. A heterogeneous mix of restaurants offering all types of Chinese, Muslim and African cuisines provides the neighbourhood with a unique fragrance. These food spaces are surrounded by all kinds of commercial activities. Twenty-four-hour stalls offering cheap calling rates to African countries emerge from practically every unused space. Makeshift (and officially illegal) currency exchange booths are side by side with stalls selling shoes and CDs and DVDs of Nigerian, Congolese, Indian and American movies and music. Every now and then one can spot ads for micro-schools for learning Mandarin and English. Uyghurs have “Africanised” their grills and instead of only grilling their traditional lamb skewers, they prepare whole chickens and fish “Africa Style.” Many restaurants around the area have followed this trend and changed from traditional noodle soup menus to fish, chicken and rice. Hotels cater specifically for African clientele. French-speaking Chinese travel agents share office space with garment shops with staff from central China who are able to speak basic Portuguese. Entrepreneurs from the Cantonese hinterland have set up Turkish BBQ houses and African bars. All this is straddled amongst a plethora of other businesses—pharmacies, grocery stores, furniture shops, fruit peddlers, electronics shops, phone repairs, Uyghur bakeries, tailors, supermarkets, hair saloons (either Chinese or African), dry cleaners and wet markets, for example, which cater for general consumption. If you spend enough time in the area—ask a few questions and knock on some doors—another layer of material practices emerges: small mosques in the malls; clandestine Pentecostal churches; hidden bars; and Ghanaian, Nigerian, Malian, and Angolan family kitchens run out of apartment rooms. In order to make better sense of how Chinese and Africans are articulating at the local level, it is useful to look at a concrete example from my fieldwork. In the midst of the vibrant conglomerate of economies, languages and ethnicities briefly sketched above, New Dengfeng Hotel stands as a crucial locale—a node at the intersection of several subeconomies struggling over and regimenting the daily activities in the area. Originally developed by Hunan migrant entrepreneurs, New Dengfeng Hotel, a “mixed business” that has trading malls, upscale Muslim restaurants, Sahelian eateries, internet cafés, mini-mosques, clandestine Pentecostal churches and hotel rooms distributed across all floors, hosts around 400 sojourners (mainly from Africa) at any one time. Seizing the opportunities brought about by the intersection of the abovementioned flows in and around this hotel, Chinese nationals from different ethnic groups have developed several microindustries in the area. Take for instance three of the most salient groups: Hui (huizu), Han (hanzu) from Hunan and Hubei, and Uyghur (weiwuerzu) people. Every day at dawn, an incessant noise rises from one of the alleys at the side of the hotel. Dozens of middle-aged Hui men, glued to their phones with calculators in hand, hold tense negotiations before swapping packs of dollars and renminbi in an informal foreign exchange market. After fixing the exchange rates, they distribute smaller amounts of money to their fellow Hui youngsters who then roam around the area offering exchange to foreign traders. While the men organise the informal “exchange activities” in the neighbourhood, many of their female relatives either manage the highly frequented 24-hour Lanzhou Halal restaurants, or are engaged in selling international phone-cards. The area in front of New Dengfeng Hotel is a small 200-square-metre open space that bustles with activity for around 20 hours every day. From early in the morning, hundreds of people converge there offering a plethora of different services. Most of this space is occupied by a non-stop ebb and flow of dozens of grey minivans driven by young men from the central provinces of Hunan and Hubei and loaded with merchandise acquired by African traders. As the minivans park, female porters from the same provinces bustle about waiting for the goods to be unloaded onto trolleys before pushing them towards the hotel rooms. Most rooms in New Dengfeng Hotel are packed to the hilt. Once a room is full, the merchandise gets taken (usually by the same women) to cargo offices in the vicinity of the hotel. There are close connections between the people working as porters and drivers and hotel staff—many of them have familial ties or come from neighbouring towns or cities in the abovementioned provinces. This tightly knit assemblage of people (sharing regional identities and kin) collectively controls a whole layer of activities aimed at satisfying trading and the everyday-life needs of transnational traders. Throughout the day, this open space in front of the hotel is a site of intense multiethnic, translocal and transnational interactions. As night falls, the area becomes a social centre for small groups of African men and women to discuss politics and exchange information about prices and markets. As these conversations emerge and trading activities seem to fade, a whole ensemble of mainly Hunan migrants carrying poles hung with colourful clothing, reminiscent of the traditional bamboo yokes, start populating the empty spaces left by the morning exchange market and the surrounding alleys. Around the same time, Uyghur grilling carts arrive colonising the space previously taken up by the minivans and the mostly young men start preparing the chickens, catering for Africans in the area. Over the course of a day, these same young Uyghurs switch from driving the pervasive small moto-taxis, to peddling freshly cut fruit, to finally participating in the grilling activities. Although the scene could come across as highly chaotic, the whole assemblage of sellers and peddlers occupying the alleys is highly regimented—the different microindustries having strong ethno-national affiliations. As night deepens, many of the small restaurants become bars and the myriad passers-by from Africa, the Middle East and China dine, drink, shop and socialise in the neighbourhood. To some extent, the presence of Hui and Uyghur alongside North African Arabic speakers, Middle Easterners and Turkish, Pakistanis and Sub-Saharan Muslims, generates a Muslim atmosphere, or to be more precise, a Sino-Afro-Muslim assemblage. If you walk out of the village, through the dimly lit tunnel and the pedestrian overpass that connect it with the more modern Xiaobei, you will find yourself in front the most prominent landmark in the area: the 15-year-old Tianxiu Building—formerly known as the Dubai Tower and more recently, albeit unofficially, the Africa Tower. The building has repeatedly been equated with Hong Kong’s famous Chungking Mansions as a centre for “low-end” globalisation in China (see Mathews 2007, 2011; Mathews and Yang 2012); and it was here that the first African and Middle Eastern traders opened their cargo offices in the late 1990s. Out of Tianxiu’s more than 700 apartments, around 65% are leased to Africans, and the rest mostly to Middle Easterners or Chinese. On an everyday basis, hundreds of people visit the first four storeys—the official commercial space in the building—where mostly Chinese shopkeepers sell all kinds of shanzhai computers, USBs, headphones, tablets and smartphones, and everything from shoes, garments, sheets and fabrics (with African designs), leather products, to powdered soap, toys, cosmetics, wigs and human hair (advertised as 100% Brazilian or Indian). The higher floors of the building are officially designated as residential and semi-commercial. In the afternoons, countless Africans pack into the elevators to visit the building’s more than 50 restaurants and eateries (some better established than others) where many West African cooks work in tandem with Chinese cooks preparing fufu, jollof, plantain and other African dishes. On the first floor, the Egyptian- and Libyan-managed cafés are critical spaces where French-, Bambara- and Wollof-speaking individuals do business and socialise. Although most Africans I have spoken to identify the building as a place to find people from all over Africa, francophones (mainly Malians, Guineans, Senegalese, and Togolese) are among the most salient. While some Africans with more “settled” histories have managed to open up small businesses such as garment shops, hair salons and restaurants/eateries in Dengfeng, Tianxiu and other malls in the area of Xiaobei, they, in no way, compete directly with internal migrants at the microindustry and subeconomic levels described above. Moreover, African-owned commercial spaces tend to be located in less accessible places—such as the top or underground floors—where rents and visibility are lower (the same goes for churches and mosques). In a way, African and Chinese businesses are together (in the same malls) but separate in distant and different spaces. Perhaps one of the commercial sites where Africans and Chinese compete and collaborate on relatively more equal grounds is in the highly competitive sector of import-export cargo and representation offices (business consultants) (Haugen 2011). Generally speaking, however, rather than competing with Chinese for local jobs, Africans in the area act as mediators weaving together multiple components in assemblages of translocal/transnational subeconomies, thus generating new and more complex economic spaces. A great number of those currently lodging or living in Dengfeng report having had knowledge of the existence of an “African neighbourhood” prior to their arrival in the city. It is in the setting of this translocal and transnational space that Chuck, along with almost all the Africans I have spoken to, started looking for contacts, business and opportunities when they first arrived. Nowadays, regardless of their current statuses (whether settled or itinerant traders, whether aspiring to “immigrate” or just wandering) most Africans converge, at one time or another, on either Dengfeng or the surrounding Xiaobei. These two areas are, however, not only a main point of entry for a great number of the Africans that pass through the city but, more importantly, a crucial site where they intersect with other Africans and with the complex ecology of Chinese migrants. Accordingly, it could be argued that the whole area is a site where transnational African flows meet with those of the transprovincial and transethnic Chinese systems—a neighbourhood where the local, the translocal, and the transnational converge. In short, I argue that the friction between transnational and translocal trading flows, and the entrepreneurial ethnic organisations and traditions of Chinese nationals, generates specific niches where microindustries operate catering services to fulfil specific visitor related needs (i.e. currency exchange, Halal food and phone-cards). The endurance of several of these microindustries has resulted in the emergence of complex and interdependent subeconomies.3 On a daily basis, these subeconomies weave supply and services, thus structuring “catering networks.” Furthermore, these networks not only make possible the recurrence and continuation of the African presence in Guangzhou but, more importantly, they lay down the foundation for the emergence of “more complex forms” of organisation that structure belonging at the individual and collective levels (i.e. representation offices, religious congregations, and leisure clubs)—what I call “networks of support.” Finally, as I have been trying to show, to construe African presence in Guangzhou as a merely “African” affair (happening within the bounded realms of an imagined “Chocolate City”) falls short of capturing the complexity of the Sino-African assemblages activated by the convergence in the city of the many actors that I have ethnographically listed above. 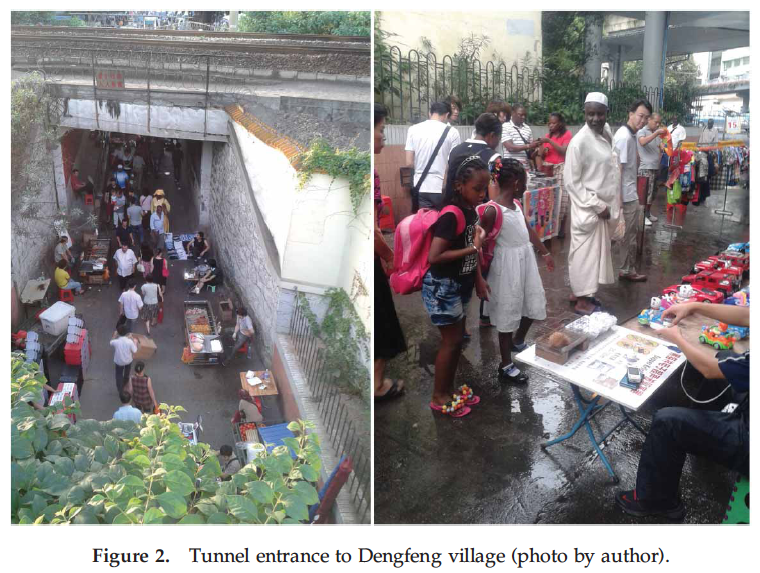 Africans are not the only transients in this case study, Chinese (and others) are also on the move: Dengfeng is a multiethnic site of translocal and transnational transiency, not really a “Chocolate City”. It is in the midst of this (briefly sketched) multiethnic translocal imbroglio that Africans (along with most others in the area) undertake, with varying intensities and strategies, complex processes of place-making. While on the first leg of my fieldwork, one of my contacts suggested I speak to Tony, a 37-year-old Igbo well known by many Africans in Guangzhou. We arrange our first meeting in a busy Starbucks in the area of Taojin, a relatively prosperous part of the city. Tony arrives by car with a physical assistant. Among the many things he does in China is manage the first Nigerian football team to have played in Guangzhou’s International League. The first thing I notice when entering Starbucks is that Tony uses a walking stick. Later he tells me that during his last trip to Nigeria, he was involved in a car accident and had his right femur broken in two places. He was hospitalised for eight weeks with several surgical interventions. Against the doctor’s advice, he rushed back to Guangzhou only two months after the accident to be reunited with his Chinese wife and their two children—one pertinent reason for his rush was that, according to a new Chinese law, his “spouse residence permit” does not allow him to be out of the country for more than three months each year. Tony, fluent in Mandarin and able to understand the Cantonese his children speak at home, left Nigeria at 25 years of age to explore the possibilities of outsourcing part of his father’s business to China. As his father was against the idea, he set out without family support. He remembers that back when he arrived in 2001, Guangzhou was very different. “There was not as much business as there is now; there were not so many people, and Chinese were not as open as they are now,” he explains. After becoming acquainted with some of the fewer than 50 Nigerians that were living in Guangzhou in 2001, he started to work sporadically, loading containers and doing other minor tasks assigned to him by his fellow countrymen. By relying on these kinds of solidarity structures, he was able to save some money to start his own business. Although, in many respects, the experiences of Tony and Chuck are similar, and they agree on many points, Tony’s understanding of China (enhanced by his language skills and cultural knowledge), and of Africans in Guangzhou, seems to be more thorough. During his 12 years in the city, he has seen a great deal of transformation, not only in the Chinese economy and in the activities of foreigners in the country but also in his personal life. In his early days, there were only three things to do. “During the week, I would try to make ends meet, waiting for the weekend to come so I’d go to church and play football,” he recounts. He rapidly realised that without language skills, he would not be able to make the outsourcing of his father’s business efficient. During his first year in the city, his friends convinced him to try his luck in the clothing business. With the little money he had earned, he was able to buy some things and send them back to Nigeria in shared containers where his relatives would sell them and send the profits back to him. As the clothing sector was thriving back in the early 2000s, he abandoned the idea of outsourcing. However, as more Africans started arriving in the city, and more Chinese went to Africa, clothing became very competitive and the profits too small. As a consequence of this and his growing financial means, he decided to open a representation office with the objective of acting as a middleman between his countrymen and Chinese producers. A great deal of what has been written about Africans in Guangzhou racialises their presence in the country. Africans tend to be represented as having constant trouble and conflict with local Chinese. Chuck, who has been interviewed several times by Western media outlets, tells me that “there is no structural racism against black people. Some people want us to say that there is, but ‘it is not the case.’ If I have problems here, it is not because I am a black man, but many people don’t want to understand this … they think that if I have trouble here it must be because I am a black man,” he explains. Tony’s point of view is somewhat similar. “When I have had problems with Chinese and tried to solve them, I have always been treated in the way I’m supposed to be treated,” he recounts. Tony argues that at the individual level of everyday interaction with the Chinese, although there might be people that dislike foreigners, he does not feel that there is racism against Africans. Tony agrees with Chuck in that there is no structural racism and he further explains that when he first arrived in China he thought that the Chinese were racist, but his views changed with time. He now thinks that misunderstandings are mostly a matter of ignorance and language. As soon as he reached a good level of Chinese, and was able to communicate with people and authorities, he was treated better. “Yes, government has their policies that are tough, but with individuals is something different,” he says. Although both Tony and Chuck seem to have a slightly positive view on the subjects of racism and discrimination, not everybody agrees with them. It is common to find Africans that complain about different forms of discrimination in their everyday interactions with Chinese—and some of them call it “racism.” Bodomo (2012) reports that cases of overt discrimination against black people are rife—especially in dealings with the police. Local authorities have deployed a variety of strategies seemingly focused on hampering what is perceived as an uncontrolled growth of foreign activity in the city. The Public Security Bureau of Dengfeng, for instance, has bilingual English-Chinese notices in all restaurants, cafés and hotels where foreigners congregate, warning visitors about the penalties for drug-trafficking, violence, robbery and prostitution. These notices are difficult to find in other areas of the city hosting significant, non-African, foreign populations. Moreover, in May 2011, Guangdong’s provincial government issued a new regulation (the first of its kind on the administration of foreigners in the country) that forces local residents to report any “malpractice” involving foreigners such as illegal entry, overstaying, working without permits or doing business without licences—this regulation comes with the threat of exorbitant fines for any residents that fail to comply (Lau2012). The feeling of being under constant surveillance and systematically harassed by authorities is one of the shared features in the place-making narratives of many of those involved in trading activities in Dengfeng. In a way, Africans in this area have been subjected to an uncomfortable regime of control similar to that applied to some ethnic minorities—erratic but systematic repression (perceived by some as discrimination). According to Tony, while the government has the right to decide how to manage foreign populations, these hurdles make it somehow difficult to feel at “home” in Guangzhou. The Nigerian Embassy estimates that over the last decade around 400 Nigerians have been incarcerated in China (Usman 2013). The primary reason is not residing illegally in the country, but rather drug-related offences and fraud. Chuck and Tony both told me that prior to 2008 many Nigerians went crazy, fighting in the streets, and getting involved in illegal activities. These problems not only damaged the Nigerian reputation but also local perceptions of Africans in general. 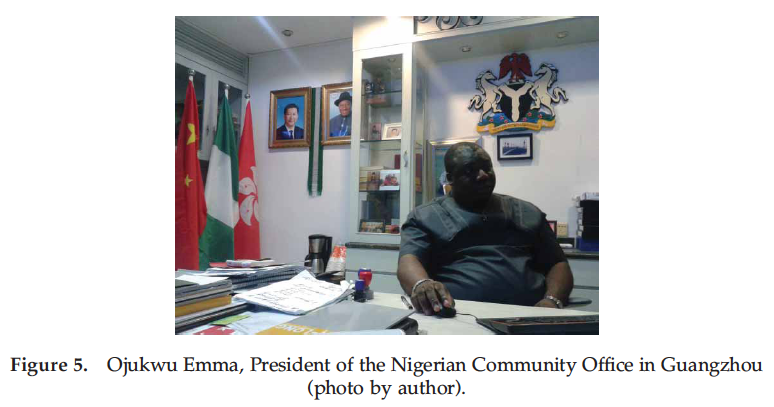 In an effort to organise, and to positively promote the image of Africa, Nigerians, Malians and Ghanaians came up with the idea of forming “community organisations.” In Guangzhou, the office of the Nigerian community, for instance, currently under the management of Ojukwu Emma (a middle-aged trader who holds the title of “President of Nigeria in China” and a claim to the more bombastic title of “President of Africa in China”) is renowned for having pacified Nigerians, and to some extent unified Africans in the city. One of Emma’s strategies has been to create a “peace-keeping” vigilante group. Chuck, who has collaborated in the group, puts it bluntly: “If you are an African in Guangzhou doing something bad, we will come to you and give you a warning. If you recur, we’ll come and get you. You won’t escape.” This vigilante group has cracked down on several individuals and handed them over to the local authorities. “We cannot allow that the wrongful action of one affects the whole of the communities in the city,” Chuck explains. In the last five years, there have been two moments of “crisis” for the African community organisations of Guangzhou. In July 2009, the second ever demonstration of foreigners in the PRC took place in the area of Guangyuan West Road (guangyuanxilu) when, following a police raid, around 300 Africans (of mainly Nigerian descent) took to the streets, blocked traffic, and congregated outside a police station.4 They were protesting against what many of them saw as systematic racial persecution and police harassment. In July 2012, a second massive demonstration took place in the same location after a Nigerian citizen died in police custody. In both these events, local authorities called on African community representatives to negotiate the peaceful dissolution of the demonstrations. Paradoxically, both these events enhanced the popularity of the community organisations amongst Africans and city authorities alike. Community offices do not only clamp down on illegal activities, or settle quarrels and dissolve angry mobs at demonstrations, however; they actively network and promote their activities in the city. According to my interviewees, these offices have organised Africans to a point in which they now claim to “have a voice” in city affairs. “Now they listen to us as a group,” Chuck says, explaining that one of the biggest successes of these organisations was procuring legal and recognised market spaces for Africans in the city (such as Guangda where Chuck has his restaurant). It could be argued that these organisations have not only asserted a “common” African identity in front of the local government, but throughout their existence, they have been functioning as sites where individuals and collective place- and community-making efforts have converged, thus generating possibilities for senses and structures of belonging to emerge. Besides community organisations (which have been, in general, locally articulated), religious organisations (branches of wider transnational spiritual networks and economies) have also emerged as a central element for place-making and structures of belonging amongst Africans in Guangzhou. Sunday is, for Tony, Chuck, and almost any other African I have spoken to, serious church day. Charismatic and Pentecostal Christian congregations, alongside the less popular, government-sanctioned, schismatic Chinese Catholic church, are highly frequented by foreigners in the city. Tony, for instance, attends the Chinese Christian congregation that his wife belongs to in the early morning; later, he goes to the Nigerian Fellowship—the Catholic Charismatic Renewal. Chuck, on the other hand, since coming to China has abandoned the Catholic church and joined the ranks of the thriving Pentecostal congregations of Guangzhou. Pentecostalism—a rising religion in China and almost everywhere else in the Christian world—seems particularly appealing to young Africans in the city. Chuck explains that it is less “official,” and that the issues that are discussed during the congregation really relate to the context and challenges they face while living in China—the opportunity for personal re-establishment in Asia is a central element in Pentecostal discourse. Paradoxically, many Africans are discovering a new type of Gospel in post-socialist twenty-first century China. Most Pentecostal congregations are semi-clandestine—illegal, but tolerated by local authorities so long as they do not bring Chinese citizens in—and pushed to the marginal settings of rented conference rooms in hotels and malls, as noted before. According to Tony, these Christian groups are vital for newcomers as they offer ways for networking and entering communities. Most of the churches, however, belong to transnational religious networks, and in some cases individuals attending the services were referred to particular congregations by members in other locations. Indeed, most of the Pentecostal churches in Guangzhou are connected to other cities in China, Asia, Africa and Europe. While these organisations structure belonging at the local level (through chains of social relationships), much of their meanings, and imaginations, are transferred translocally and transnationally. At the collective level, these community and religious organisations operate as “networks of support,” structuring opportunities for individuals to make sense of their sojourn in Guangzhou. The possibilities for the existence of these networks rely highly on the “catering networks” and the translocal subeconomic processes described in the first part of this article. The intersections between individuals, collectives and economies generate assemblage-like formations, in which the local, translocal and transnational processes discussed throughout this article intersect and transgress each other. In short, I claim that the connections resulting from these assemblages nurture structures/spaces of belonging crucial in the process of the reproducibility of African presence in the city. Dengfeng, or the “Chocolate City,” is a place-based site constantly reproduced by the frictions between local and circulating populations. I like to think of Dengfeng as a process—a site continuously linked, delinked and re-linked by people, economies and their cultures, to other locales. In this sense, Dengfeng is a node in a network of economies and cultures—a “translocality,” to use Arjun Appadurai’s (1996) term. 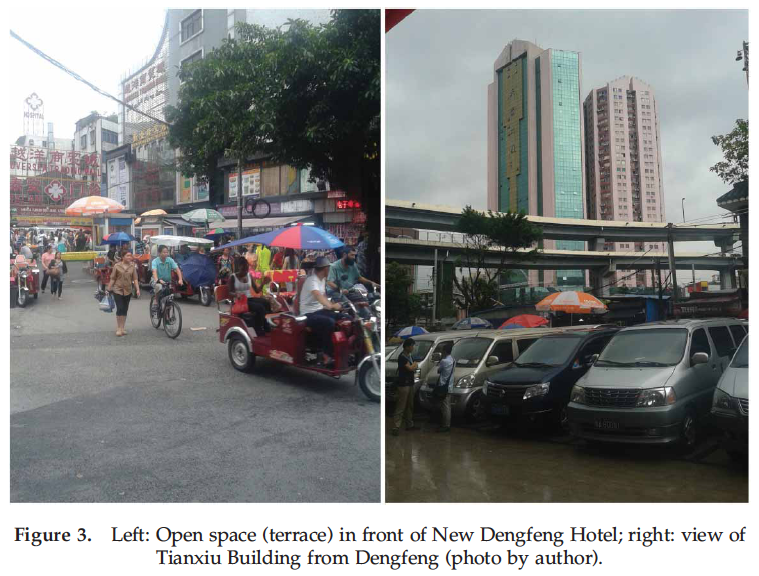 If we follow Appadurai’s conceptualisation of (trans)locality, then Dengfeng is not only a neighbourhood (a situated space) where locality is “variably realised” (Appadurai 1996, 179) but a space where multiple “forms of circulation” (of people, goods, technologies, and imaginations, etc.) have generated extended multiscalar connections involving several other localities. In these days, increasingly, the (re)production of locality seems to be more obviously translocal/transnational. Translocalities are not only conceptualisations, however. They can be “found” out there (or at least mapped down). In short, the relationships structuring translocalities occur in cartographical plains (they are place-based) but they are also ungrounded (McKay 2004)—buoyant assemblages of relationships and connections: networks. As a translocality, Dengfeng has manifold functions. The multiple activities taking place there, for instance, have the capacity to organise sense-making narratives of a strong and enduring African presence in the city—thus opening up possibilities for the (re)production of Sino-African translocal assemblages and for multiple senses of belonging to emerge. Moreover, the networks that nurture the emergence of the translocal/transnational practices described in this article extend along complex pathways and across local, provincial, and national borders and imaginaries. In this way, spaces such as Dengfeng (although physically bound within a nation-state) are structured by myriad sets of relationships that in their interactions pay respect to no boundary. Finally, as a local, translocal and/or transnational site, the so-called “Chocolate City” is crucial to make sense not only of the place-making strategies and processes of belonging that Africans have been structuring but also about the ways in which the multiple Chinese economic systems have been adapting to, intersecting with, and transgressing the requirements set up by the process of China’s re-articulation as a key global player. Adams Bodomo (2010) has made a forecast that has left more than one scholar frowning. 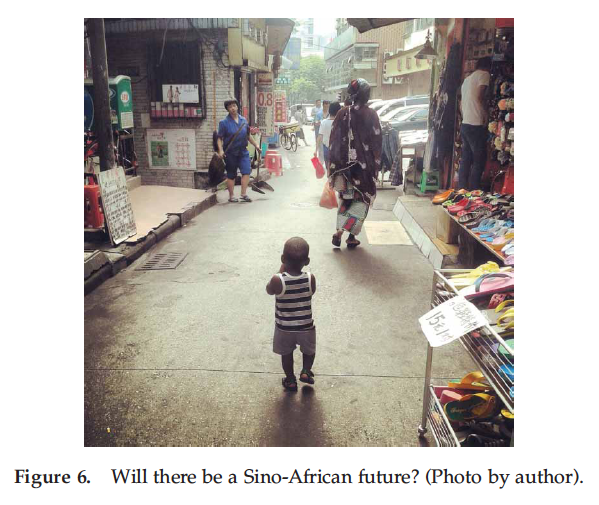 Based on the pace of African arrivals in China and the ways in which they have been mixing with Chinese, he contends that Africans are sowing the seeds for the emergence of a Sino-African ethnic group in less than a hundred years’ time (Bodomo 2010, 694). Africans, he argues, have come to stay. Anyone that knows a little about China knows how instability and uncertainty are the great enemies when trying to elucidate the future of what we now know as the People’s Republic. As such, no one can really deny (or support) Bodomo’s claim. As most of my contacts in Guangzhou argue, China is not an easy place. I have not found any African yet that thinks of China as his/her “home.” There are many hurdles. Nonetheless, many believe that with time and politics these hurdles will diminish and they will be able to call China “home.” Chuck, for one, is hopeful that the Chinese government will eventually yield to the pressures of globalisation and allow for a full inclusion of foreigners into the Chinese social system. This remains to be seen. If his hopes are not realised, he will go somewhere else, but not back to Nigeria. Tony, on the other hand, claims that there is no way for an Igbo man to call home any place other than eastern Nigeria. He now has more friends in China than in his country, however. His plans are to raise his children in Guangzhou, then send them to Nigeria to learn English in high school, before bringing them back to China for university. Will they be part of the first generation of Sino-Africans in the PRC? Will contemporary African presence in China fade away after a few decades? Will current transformations lead China to embrace an even more multi-ethnic (transnational) society? These are serious questions that need to be considered. To start answering them, I propose to use this case study as a platform to discuss how African and Chinese national, ethnic and cultural identities are being reworked and renegotiated in the context of diasporic cultural globalisation. I suggest that we strive to generate a framework to better understand the movements of people across these two civilisations that moves away from methodological approaches that rely on binary divisions such as South/North and origin/destination. Furthermore, echoing Kuan-Hsing Chen’s (2010) call for the decentring of knowledge production, I contend that we need to open up our theorisations to allow for the discussion/understanding of transnational movement/mobilities and (perhaps) “migration” in non-western, non-liberal democracy, canvasses. 1. Mostly phones, motorcycles, garments, steel products and machinery carried out predominantly by individual exporters. 3. Although these “subeconomies” often have strong ethnic affiliations, I do not define them as strictly “ethnic economies” as I conceptualise them as operating within multiethnic assemblages on translocal and transnational scales—and not only within one ethnic identity registry. 4. African students demonstrated in the streets of Beijing in mid-1986 against what they saw as an “oppressive environment” and “unfriendly people” (Snow 1989). This article proved to be very enlightening. I will like to know your opinion on an issue however. I am a 25 years old Nigerian with an MSc in Network Computing with Distinction from Coventry University, UK. I made lots of Chinese friends while I was in the UK. I became close with one of them whose uncle has an IT firm in Guangzhou. I sent my CV over and they are quite interested in me and prepared to get me the necessary documents needed for a work visa. It seems like a once in a lifetime opportunity to work in another country and boost my CV. I have no plan of settling down in China though. I also have no plan of involving in trading of any sorts. I am basically an IT professional. Your writeup made no mention of Africans seeking professional jobs in China (Guangzhou precisely) and I will like to know your opinion about that because articles I’ve read so far have not been too positive with regards to getting proper documents to work in China for about 2 years. Also, how easy is it to get residency permits in Guangzhou after getting the 3 months work visa. It has been instructed that holders of the work visa need to get residency permits within 30 days of entry and I don’t plan to stay in any country illegally. The only way to work in China is if a company arranges a visa for you. In this country there’s not many chances to come and look for a job – it’s possible, but this should not be imagined as in the ‘West’. Your visa links you (forces you to stay) with the company that hosts you. I’m not an expert in ‘working visa’ related issues, so, I’m only talking from my experience of working in China. Work visas (Z) are generally for a one-year period, then the company must renew & not all companies have the capacity to apply for visas for foreigners (you’re supposed to have an expertise that no one else (i.e. a Chinese) has – for them to justify your presence in the country). These are only some disjointed thoughts in haste. Email me if u have more questions.